When it comes to cute kids with huge personalities, today's feature is certainly high up on the list! With mommy groups, swimming lessons, and more on his pint-sized agenda, it's a wonder he doesn't need a secretary, not just an energetic mommy! So how does she do it? With a good stroller, a bus pass, and a properly stocked diaper bag! Most Important Thing in Your Diaper Bag: Distraction objects! Benjamin can't sit still for more than 3 seconds, so diaper changes are extremely difficult. He is constantly trying to roll over. Keys, cell phones, his soother, a clean diaper.. all work well to keep him entertained while lying down. Basic Save: Wipes. Buy bulk, buy on sale, buy the cheapest brand! They're for poop: don't need anything fancy! OH and always tether everything to your stroller. Babies love to throw and drop stuff. We would have lost so many items if we hadn't bought our handy Elmo tether. Plastic baby links work great too. 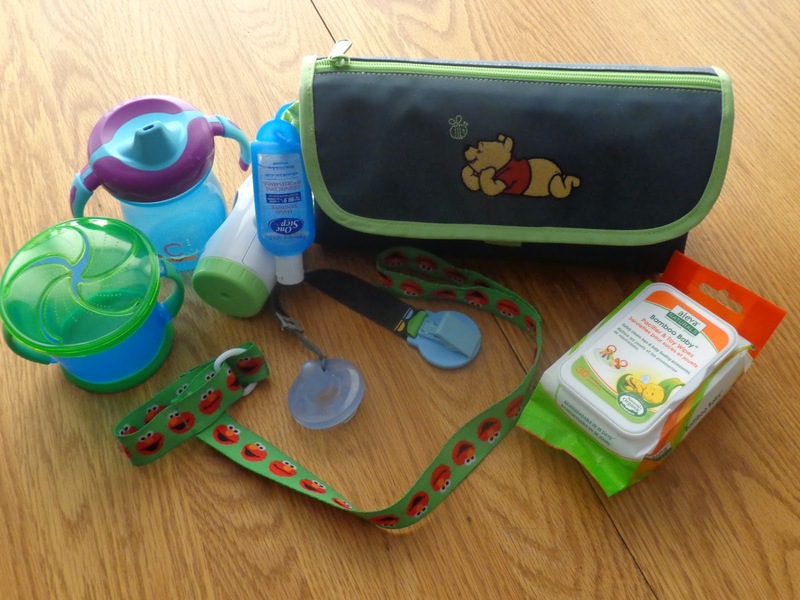 Left to right: Snack container, sippy cup, portable diaper genie bag dispenser, hand sanitizer, changing pad (folded up, it holds wipes and diapers inside), tether, soother + soother clip, soother/toy wipes. Baby Food - What and When?